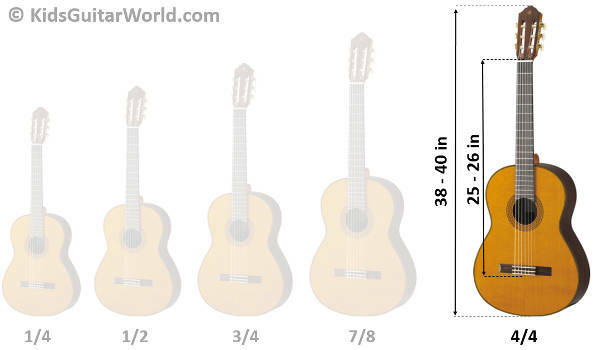 A 4/4 size guitar is the biggest guitar size existing on the market. So this isn’t actually a guitar only for kids. The more typical name of this size is actually full size guitar. For kids from 12 years this guitar size is in most cases the right choice. There is a huge choice of full size guitars on the market, nevertheless whether you are looking for an acoustic guitar with nylon or steel strings or an electric guitar. If you are looking for a first guitar for your chilkd then it doesn’t make too much sense to buy the most expensive model. 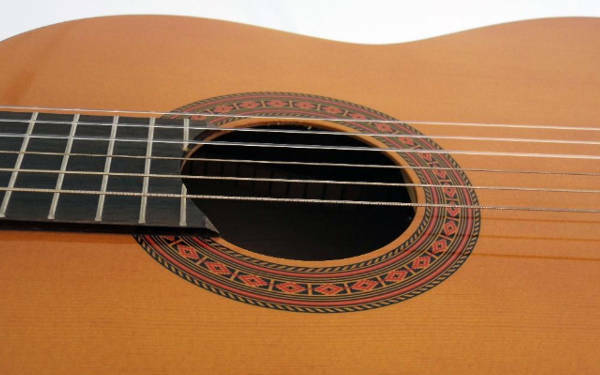 In addition, you should rather get an acoustic guitar with nylon strings since these kind of strings hurt much less the fingers of a beginner. If your child would like to play absolutely on an electric guitar, you can go for it. An electric one is equipped with steel stings but the tension is quite less and steel string for electric guitars a re also quite thinner. 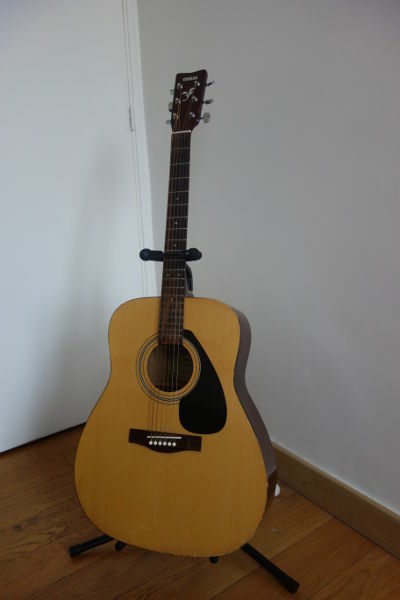 So, first choice is an acoustic guitar with nylon strings, an electric guitar should also be fine for most cases but try to avoid acoustic steel string guitars for young beginners. Yamaha is one of the best-known manufacturers offering affordable high quality entry-level guitars. I would even say that most young guitar beginners start on a Yamaha model. If you take a look in classrooms most of the kids have one from Yamaha. The Yamaha-C40 is an excellent model in the entry-level segment for a very fair price. Another good beginner guitar with nylon strings is the Cordoba C3M. Cordoba is quite wellk-known for high quality classical guitars. This one is quite similar to the one from Yamaha but the finishes look just a bit better. But in general, both guitars, from Yamaha or Cordoba, are great beginner acoustic guitars. If you are looking for a good entry level guitar for a young beginner you should consider the Jasmine S35. For under $100 you a get really nice looking and sounding guitar. The thing with guitars at that price is sometimes the setup. If the guitar action (distance between strings and fingerboard) seems to be too high for you then go with it to the guitar shop. There is nothing to worry about a wrong setup because they will easily set the right action for your which may cost $20. One of the best known guitar manufacturer is without doubt Fender. 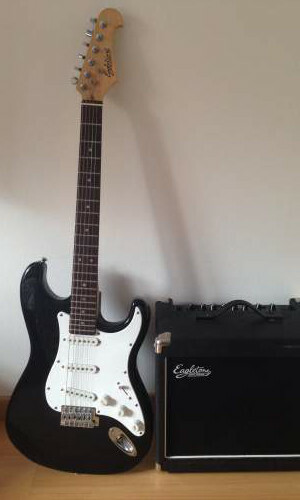 They have got also a pretty nice entry level guitar which is also sold in a bundle. The Fender Squier Acoustic Bunlde comes with a ligh bag, a couple of new strings, a tuner, picks and a strap. This really all you need to start. You may consider getting a more solid r padded bag if your child carrys it around regularly. When talking about quality entry level instruments there has to be an instrument from Yamaha aswell. The Yamaha FG800 is a pretty nice looking guitar and this one comes with a solid spruce top. A sold top give always a better sound to a guitar. It comes also with some extra stuff like tuner, strings and strap. In addition to that, you will get also a hardshell case which is actually quite rarely to find in a bundle for beginner guitar but definitely a big plus. This one is also available in black. When buying an electric guitar, don’t forget to get an amplifier and a cable to connect your guitar with the amplifier. The best for a beginner is actually to get a package with all the necessary equipment. Yamaha offers also a good affordable bundle with a full size electric guitar, an amplifier, a cable and much more as tuner, strap and picks. The Yamaha-Pacifica-PAC012 is available alone but for every beginner it’s defintely a comforable option to get his one in the package. Other interesting bundles the Epiphone Les Pauls or the Squier Fender Affinity Electric Frontman where both are also available in different styles.